British and American Pool appear similar at first glance, but each style offers its own unique qualities to the game. From its European origins, pool has developed into a whole category of games, each with its own accessories and set of rules. Understanding the difference between British and American style pool may lead you to discover a new favorite way to play. The most marked difference between British and American pool is the ball size. The British cue ball is 57% smaller than the 2inch object balls, at one inch and 96 g. The main purpose of the size difference is for coin operated tables to separate the cue and object balls, but almost all British pool ball sets contain the small cue ball. British object balls are generally red and yellow, with one black eight ball, although sets containing solids and stripes are also available. Eight-ball is the most popular game to play with British pool tables. The small ball size requires a thinner, but strong cue. British cues are about 8-9 mm wide, with a brass feral, and are usually made of ash. As with its other components, British pool tables are sized down. The most common size is 7ft long. Smaller tables are perfect for crowded pubs. The cloth on a British table has a distinct texture that will eventually wear down over time. The texture adds an extra challenge to game play. The pockets on British tables are petite and rounded. This style of pocket makes shooting down a rail more difficult, but shooting into side pockets easier. The cushion on a British pool table is flat, with the cloth creating an angle against the playing surface. American Pool features equal sized object and cue balls. The 2 ¼” and 169g balls give American pool a distinctly different play than British pool. American pool is played with stripes and solids. The games that can be played with an American pool set are endless. American cues are generally constructed of light maple, with a 13-14 mm tip, and a plastic feral. The plastic is necessary for shock absorption and is ideal for striking the larger, heavier cue ball. 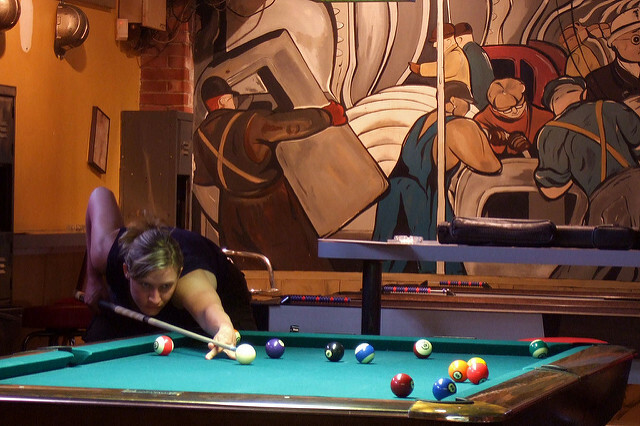 The American pool table can vary in size, but tournament size is 9ft long. Home pool tables tend to be about 8ft with other size variations available. The smooth cloth on American pool table allows for speed. Friction from the acceleration of the cue ball can cause small burn marks, over time, in the cloth. The pockets on an American table are just wide enough to fit two balls side by side. These pockets are sharply angled, the cushions appearing blade-like. Shots along the cushion into corner pockets are easier on American tables. Side pocket shots are more difficult. To sum up, British and American pool tables differ mostly in appearance. However, these differences make differences in game play experience. If you frequently play pool in pubs or recreational centers, it is likely you’ll be more comfortable playing on a British pool table. If you play pool in bars and pool halls, you will probably enjoy playing on American pool tables more. American pool tables are easier to learn how to play pool on, ideal for families and children. British tables offer more challenge for those wanting to hone their skills. The American-style pool table is most common, world-wide. For tournament play, you will want to practice on an American table. Stylish designs are available for every décor taste in American style pool tables. Both American and British tables have features that are better suited to different player. It’s a matter of personal preference as to which will be better for you. If you are looking to purchase a beautiful pool table, GameTablesOnline.com offers the best in style, price, and quality. See our full catalog for billiards accessories, custom table options, and everything you need for your ultimate game room. If you have any questions about our products or services, contact our team, here. This entry was posted in Pool and Billiards by admin. Bookmark the permalink.